Monsanto VS Dewayne Lee Johnson. Historic Ruling Against Monsanto Finds Company Acted with “Malice” Against Groundskeeper with Cancer. California jurors have awarded $289 million in a historic verdict against Monsanto in the case of a school groundskeeper who developed cancer after using its weed killer, Roundup. We speak with Brent Wisner, the lead trial counsel for Dewayne Lee Johnson, who has non-Hodgkin’s lymphoma. Doctors say he is unlikely to live past 2020. Johnson’s was the first lawsuit to go to trial alleging glyphosate causes cancer. Filed in 2016, it was fast-tracked for trial due to the severity of his illness. We begin today’s show with the historic verdict in the lawsuit against U.S. agribusiness giant Monsanto. In a groundbreaking decision, a jury in California has ordered Monsanto to pay $289 million in damages to a school groundskeeper who developed cancer after regularly using the weed killer Roundup. The 46-year-old man, Dewayne Johnson, has non-Hodgkin’s lymphoma. Doctors say he is unlikely to live past 2020. Judge Suzanne Ramos Bolanos read the jury’s verdict. JUDGE SUZANNE RAMOS BOLANOS: Would a reasonable manufacturer, distributor or seller under the same or similar circumstances have warned of the danger or instructed on the safe use of Roundup Pro or Ranger Pro? Answer, yes. Was Monsanto’s failure to warn a substantial factor in causing harm to Mr. Johnson? Answer, yes. Claim of damages. What are Mr. Johnson’s damages? Past economic loss, $819,882.32. Future economic loss, $1,433,327. Past non-economic loss, $4 million. Future non-economic loss, $33 million. With regard to punitive damages, did you find by clear and convincing evidence that Monsanto acted with malice or oppression in the conduct upon which you base your finding of liability in favor of Mr. Johnson? Answer, yes. AMY GOODMAN: The jury at San Francisco’s Superior Court of California deliberated for three days before finding Monsanto had failed to warn Johnson and other consumers of the cancer risks posed by its weed killers. Johnson’s was the first lawsuit to go to trial alleging glyphosate causes cancer. Filed in 2016, it was fast-tracked for trial due to the severity of Johnson’s illness. He spoke after the verdict was delivered. DEWAYNE JOHNSON: Since the beginning of this case, I’ve received a lot of support and a lot of thank you and a lot of prayer and a lot of everything, just good energy, from a lot of people that I don’t even know. I am glad to be here to help with this situation. After I learned about Roundup and glyphosate and everything, I’m glad to be here to be able to help. The cause is way bigger than me, so hopefully this thing will start to get the attention that it needs to get right, so folks can make a good choice. AMY GOODMAN: Johnson’s attorneys said jurors for the first time were able to see internal company documents proving Monsanto has known for decades that glyphosate and Roundup could cause cancer. Monsanto is a unit of the multinational pharmaceutical corporation Bayer and now faces more than 5,000 similar lawsuits across the United States. For more on Friday’s verdict, we are joined in Los Angeles by Brent Wisner, the lead trial counsel for Dewayne Lee Johnson in his lawsuit against Monsanto. Welcome to Democracy Now! Can you first respond to this historic verdict? A jury almost awarding your client $300 million as, well, he may be in the last years of his life. BRENT WISNER: Good morning. This verdict is without question truly historic. What Mr. Johnson has done taking on this massive corporation—the courage, the tenacity and the willingness to speak out against what he believed was a real problem is truly spectacular. And this jury heard it. This verdict is groundbreaking, it’s precedential. It’s something that I think Monsanto and its shareholders, particularly at Bayer, are hearing loud and clear and realizing that they have a problem with this product and they have to start warning people that it can cause cancer. AMY GOODMAN: Tell us Dewayne Lee Johnson’s story, Brent. BRENT WISNER: Lee is just an amazing man. He started working at the Benicia School District in 2012. He was actually promoted. Originally, he was just sort of running mail around the school, and then he became an integrated pest manager. As part of that job, he was spraying Roundup on these various school campuses as part of the school district. He would spray upwards of 150 gallons a day trying to handle the weed situation. During that time, he was exposed repeatedly, repeatedly. Prior to that, he had perfect skin. After that, he started developing these tumors on his skin. They didn’t know what it was at first, and they discovered it was a rare type of non-Hodgkin’s lymphoma that manifests in the skin. And the cancer got worse. It got worse. It got worse. Mr. Johnson actually reached out to Monsanto while he was spraying to ask them, “Hey, is there some connection between this product and this cancer that I’m getting?” And they said they would call him back and then they never did. Then he called back a second time and he continued to spray, waiting to hear back from Monsanto and they never called. And what we learned was that his cancer, while he was spraying, it transformed. It went from a relatively controllable type of cancer to one that is essentially a death sentence. 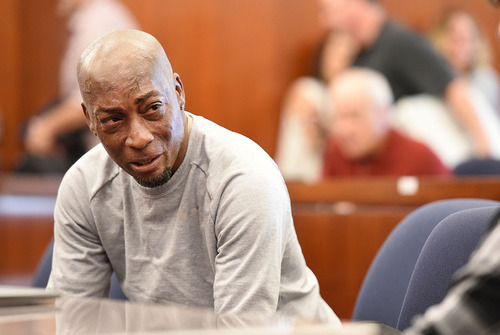 The fact that Monsanto has never called him back and the fact that they never warned him deprived him of the ability to make an informed choice. And Mr. Johnson, when he finally put two and two together, he called us up and we took it to trial and sort of history was made. AMY GOODMAN: I wanted to read the statement of Monsanto. We reached out to the agribusiness giant to join us. They weren’t available, but they did provide us with a statement that said they plan to appeal the verdict and insisted glyphosate does not cause cancer and did not cause Dewayne Lee Johnson’s cancer. This is the statement from Monsanto Vice President Scott Partridge, who said, “We are sympathetic to Mr. Johnson and his family. Today’s decision does not change the fact that more than 800 scientific studies and reviews—and conclusions by the U.S. Environmental Protection Agency, the U.S. National Institutes of Health and regulatory authorities around the world—support the fact that glyphosate does not cause cancer, and did not cause Mr. Johnson’s cancer. We will appeal this decision and continue to vigorously defend this product, which has a 40-year history of safe use and continues to be a vital, effective and safe tool for farmers and others.” Your response to that, Brent Wisner? BRENT WISNER: There are really three points that are worth mentioning. The first is this idea that there is 800 studies that test Roundup and say that it’s safe is just a fabrication. The studies he is talking about are largely not related to cancer. We’re talking about skin irritation, eye irritation, things that really have nothing to do with the issues here. When you talk about cancer, we’re talking about 20 or so studies. Six or seven of them are in humans; the rest are in animals. And those studies, as the jury was shown, are almost completely positive. So that is just fact number one incorrect. The second thing that is really important is this idea it has a 40-year history of safety. Almost absent from the conversation is that for the first 20 years, Roundup was actually approved based on fraud. It was coming from a laboratory that has been known—people were indicted, people went to jail, and that was actually a former Monsanto employee. And so this idea that it has a 40-year record of safety glosses over 20-year history of fraud, at least at the very beginning. And the last thing is, and this is really important, is that Mr. Partridge doesn’t say Roundup doesn’t cause cancer; he says glyphosate. And he does that intentionally, because he knows that glyphosate is different than Roundup. Now, glyphosate is part of Roundup, but Roundup is a combined product of glyphosate plus a bunch of other chemicals that make glyphosate significantly more potent. And one of the things that the jury really focused on, this jury in this case, was that there is a synergistic effect of the glyphosate and the other chemicals. And the simple fact is, Monsanto has never tested the carcinogenicity of the combined product. This omission is glaring, and it’s intentional. In fact, we have internal documents that say, “We do not want to look at this issue because we are afraid of what we’re going to see.” And the jury heard all of this and they rejected this idea that it’s a safe product, that it doesn’t cause cancer. They said not only does it cause cancer, but that Monsanto acted with malice in doing so. And I think that is really important. AMY GOODMAN: What did these internal documents that you got a hold of show? This is extremely significant given how widespread Roundup is around the world, and for both Monsanto and the people who use it here in the United States, there are already 5,000 lawsuits behind this one. BRENT WISNER: There’s a lot of documents, but what they really show is sort of a rampant corporate culture that has no interest in looking at whether or not their product is safe, but have an interest in attacking science this doesn’t suit their business agenda. And that’s just simply what we see. When a bad study comes out, the emails that circulate amongst Monsanto employees is, “How do we combat this? How do we fight this? How do we take this person out?” It is actually given a name within Monsanto; it’s called “freedom to operate” and they actually have a budget assigned to this particular action. And a lot of scientists, when we first got involved in this litigation said, “Listen, I think it causes cancer, but I can’t help you. I don’t want to fight Monsanto. They’re bullies.” And that is what the documents show. AMY GOODMAN: Brent Wisner, the division between the compensatory and the punitive damages, can you explain what exactly the jury verdict means? BRENT WISNER: Sure. The compensatory damages are really the amount of money that it would take to make Mr. Johnson and his family whole. To kind of—I mean, I don’t know how you pay for the pain and suffering associated with the type of cancer he has, but that’s what the jury came up with, and that was around $40 million. The punitive damages are not really about Mr. Johnson; they are really about Monsanto. They are about looking at what Monsanto has done and asking, “Does that need to be punished?” And if so, what is the amount of money to not only punish Monsanto, but to deter future wrongful conduct? When I was talking to the jury in our closing argument, I told them that this was a chance to send a message to Monsanto, that this was a chance to actually maybe even change the world. And I think that resonated with the jurors because they saw that if they could make Monsanto pay a certain amount of money, that it actually might lead to future correct conduct so the next person that calls Monsanto or uses Roundup can make that decision with an informed choice. And I think it’s important—no one is saying it should be banned. No one is saying we should take it off the market. I mean, people still smoke cigarettes today, right? But they smoke cigarettes knowing the risks. And that’s all we’re asking for here, is “Monsanto, just disclose the risks. Warn.” And if they can do that, then they can start taking steps in the right direction. AMY GOODMAN: Doesn’t the federal government play a role here? Why is this all approved? BRENT WISNER: That’s a really good question. Unfortunately, the answer is a little disturbing. Some of the evidence that we showed the jury about Monsanto was a very kind of unhealthy and kind of creepy relationship between Monsanto and the regulators at the EPA. We have text messages, email conversations where various EPA employees are actually going out of their way to stop other agencies from investigating this issue, and going out of their way to sort of gain approval for Monsanto. And that is disturbing, right? Because the regulators are supposed to be detached. They’re supposed to be doing an objective and honest assessment. This regulatory EPA did not do that. In fact, they convened a scientific advisory panel to critique what the EPA was doing. These independent scientists came together and they unanimously agreed on one fact that the EPA was not following its guidelines. The reason why the EPA is giving Monsanto special treatment is actually unknown, but there is a lot of smoke and I suspect there is a fire. The Department of Justice has actually opened an investigation into this exact issue, although I am not holding my breath that we will see the fruits of that investigation under this current administration. AMY GOODMAN: There’s a difference between how the U.S. government is responding—the French government promised in May glyphosate would be banned for its main uses by 2021 and for all its uses within five years. BRENT WISNER: That’s right. And actually, Germany is taking a similar approach. Austria. A whole host of European countries are saying, “We don’t agree with our European regulators. We agree with the International Agency for Research on Cancer.” And they’re taking a lot of important steps to actually banning this product in Europe. And if that happens, then you would have to think that the U.S. would at least listen to this outcry. But again, I’m not holding my breath with the current a administration. AMY GOODMAN: And the issue of rolling back regulations even more than they have been. BRENT WISNER: That’s right. And that’s really a problem here, because there is an incentive to use this stuff because it helps you sell more crops, right? So it’s not like there’s not a—the synergy between the financial interests and the safety interests are not aligned here. And the problem is that the people who are paying for the pesticides are usually not the people spraying them, and so we have a lot of immigrant workers, particularly here in California, who are out there spraying this stuff. They’re not being told about the risks. They’re not given proper precautions. And then of course, they’re being marginalized by the legal system because of their immigration status. And so it is a real public health crisis and it’s something that I think the EPA needs to step in and do something about. California has actually taken steps. The state of California has determined it is a substance known to cause cancer, and they’re actually having a fairly protracted legal battle with Monsanto, trying to force Monsanto to warn. But again, that is sort of a legal fight that I hope California will prevail on. AMY GOODMAN: Brent Wisner, we want to thank you for being with us, attorney and lead trial counsel for Dewayne Lee Johnson in a lawsuit against Monsanto. Johnson developed cancer after regularly using Roundup weed killer at a school. A jury has just awarded him $289 million in damages. When we come back, we’re going to speak with the author of the book _Whitewash: The Story of a Weed Killer, Cancer, and the Corruption of Science.” And then we go to Yemen, where scores of funerals are being held. Forty schoolchildren were killed in the U.S.-backed Saudi bombing of a school bus. Stay with us.